There is much discussion these days about disruptive technology. Cell phones replacing land lines, electronic fuel injection replacing carburetors, and the calculator replaced the slide rule. What about analytics? Do elementary schools still use flash cards for students to memorize “times tables”? Data warehouses, in-memory computing, streaming data from connected devices and high-speed analytics are all available to Six Sigma professionals for their projects. In the 21st Century, we are inundated with data and information from all directions. Analytics now encompasses an area where technology allows us to obtain, search and analyze more data at speeds that make decision-making in true real-time more commonplace. In Six Sigma, for example, tools in the DMAIC framework guide teams through projects in a disciplined fashion. Six Sigma statistical methods depended on sampling because the lack of advanced technology that precluded handling high volumes of data easily. In fact, whole college courses were devoted to sampling methods. Technology changed that and became disruptive to many sampling techniques as well as courses. Some analytical tools are described in detail while others summarized to show their disruptive nature as compared to historical views of analyzing processes and data. 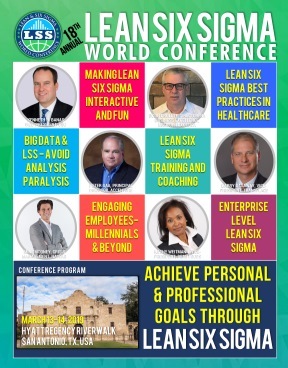 Hopefully, an introduction to these topics will be helpful for seeing the disruptive nature and benefits for Six Sigma professionals. The disruption of DOE by Machine Learning, surveys by social media, value stream maps by discrete event simulation with Machine Learning will include regression, decision trees, and neural networks. Natural Language Processing will be defined for use in text analytics. The areas of text analytics that will be explored include VOC, maintenance logs, and medical records. Two areas of text analytics that will be presented. The first area will search for topics in text and the second will show how topics can be extracted from documents.